Minibuses are excellent vehicles, whether you need to transport guests at a wedding, travel across the country on a stag do or get away with the family, a minibus is available to cater to your needs. 14 seat minibus hire is something that is popular amongst business and commercial customers as it is with domestic users. 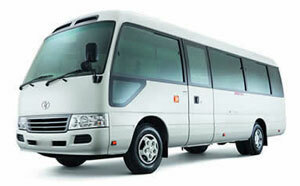 14 seaters are available in either standard or luxury models and comes self or chauffeur driven. 14 seat minibus hire is seen as the perfect minibus, offering the space and luggage capacity of a larger vehicle whilst remaining small enough to be easy to handle. In the UK, any minibus with up to 16 seats can be driven using a standard car licence, meaning the 14 seater needs no special licence classifications. Companies supplying this size vehicle may however ask that a driver is over a certain age and has a degree of driving experience. The age requirement varies from a minimum of 21 to a maximum of 75 and the driving experience will generally be between 12 and 36 months with no accidents during that time. 14 seat minibus hire will only require a deposit if the vehicle is hired on a self-drive basis although some companies may ask that one is put down to reserve a vehicle. A deposit is needed to cover the company in the event of any damage occurring to either the interior or exterior whilst the minibus is in your car. A deposit will vary depending on the company but is generally in the area of £200-£500, this will be forfeited should any damages occur. Because of this it is wise to perform a quick inspection of the vehicle prior to hire to avoid being accused of any damages. Some companies can offer Collision Damage Waiver (CDW) in place of a deposit; this will cover the vehicle for any damage or theft whilst in your possession. There will be an excess to pay on the waiver which will differ depending on your choice of company. Minibuses are extremely popular during peak holiday periods of the year and on bank holidays; this is especially true in the case of 14 seater minibuses which are not as widely available as 15 and 17 seater models. Having the necessary travel plans in place early will allow you to reserve the minibus of your choice. Booking early will also give you a better chance of getting 14 seat minibus hire on you preferred dates although it is wise to have alternative dates as a back- up. Some companies are able to provide discounts on early bookings which can often save you 5-10% on your hire. Not all companies in the UK are able to provide 14 seat minibus hire and finding one may prove tough at times. National Minibus Hire and coachbroker.co.uk are two recommended websites that will help you to find the perfect minibus in all areas of the UK.